The Hunger Games trilogy is a popular Young Adult fantasy trilogy. The movies created from them are equally as well loved. This companion is for the second of the trilogy Catching Fire and I found it a fascinating read. Even though it would be great to dip in and out of, I was riveted and read it cover to cover. I was interested not only in how the film was made, but also why and what the producers/director were trying to achieve. This was explored in interviews with the director, author, actors and others. 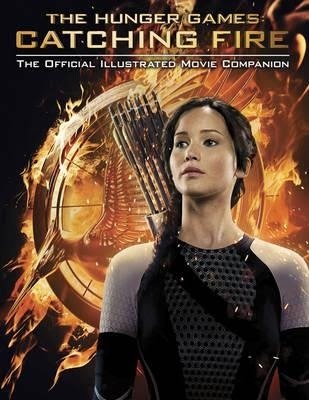 Catching Fire – The Official Illustrated Movie Guide is a large format book stuffed full of glossy photographs of everything related to the making of the movie – behind scenes, on set, film stills, posters, promos, sketched designs. It gives a little of the back story and what’s in the future, but mostly concentrates on just the making of Catching Fire. This is a dystopian fantasy, set in a world created very strongly by author Suzanne Collins, and being a very visual concept with incredibly extravagant costuming, the designers of the film had to often think outside of the box. The details about casting, design, costuming, how the actors trained and building the sets are interesting, but also the companion has been well written making it fun and easy to read. And all without giving away much of the plot. Being a visual film, it translates well into this highly visual companion and I would highly recommend it to those who love the books/movies or for anyone interested in how movies are made. As with the books and movies, this release is for teenagers, not primary aged children. Now I’m off to see the movie.